This work is a woodblock print by Utamaro from a series called the “Ten Types of Female Physiognomy”, which is a set of ten oban-size nishiki-e created in the Kansei era (around 1791-92) at about the same time as the “Female Facial Types of Ten Classes”. The two series are masterpieces executed by utamaro in the prime of his artistic creativity. During this period, Utamaro innovated a new format, i.e. close-ups of heads and half-length portraits. Whereas pictures of beautiful women by Torii Kiyonaga, a ukiyo-e artist of the earlier Tenmei era (1781-89), executed fullfigure portraits emphasizing the graceful postures and beautiful costumes, Utamaro focused more on the women’s facial expressions and hairstyles. 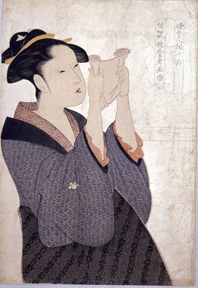 Utamaro used the technique of kirazuri, and sprinkled mica dust onto the background to heighten the effects of the flesh tone. Mica was expensive at the tie, and this print was undoubtedly a luxury item.